I've rediscovered an old friend. Twenty-some years ago, when the writing muse kept scratching at my brain and tempting me to put word and thought to paper, I discovered a tool that was invaluable to me--Writer's Market. Part of the Writer's Digest family, the book was (and still is) a wealth of information that shared not only current markets but contact names, what they were looking for, how to submit, and basic and sometimes advanced, how-to writing articles. I bought my fresh new copy of Writer's Market every Decemnber and devoured it. 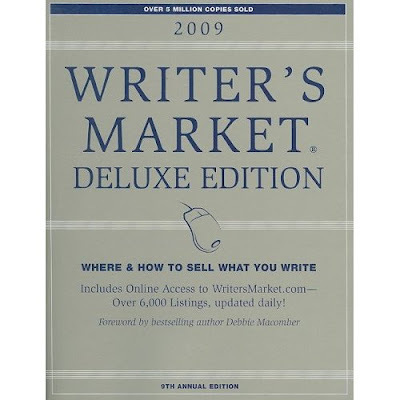 Sometimes I bought Novel Writer's Market or Poet Writer's Market or just the plain Writer's Market... and I often subscribed or picked up at the bookstore the most recent Writer's Digest magazine. I ate this stuff up! Back then, I was pushing for bylines and publishing credits anyway I could get them. And it worked. I wrote a couple of columns for local papers and magazines. I submitted Op-Ed pieces to regioual papers. And I worked the query process with magazines, big and little. Then, I started moving more and more into fiction and after a while, my writing was focued entirely on fiction and novel writing. With one exception--I was writing a heckuva lot of non-fiction in my day job. After several years, I realized that I have dozens of published non-fiction clips. Wow! I'm credible in the non-fiction world. I have bylines and work published nationally. My brand spankin' new 2009 Writer's Market arrived on my doorstep last week and opening its pages was like greeting an old friend after a long absence. I've spent hours working through it. And guess what! This deluxe version also has an online subscription with constant updates. How cool is that? A big change from my 1989 version. A great deal! So don't forget that Writer's Market is a excellent tool and resource for both your fiction and non-fiction writing needs. This 2009 deluxe version has listings for agents, large and small press fiction, magazine, journal and newspaper, plus some helpful articles and of course, the online updates. Pick up this old friend if you haven't perused one in a while.